#3. Are Supplements Helping You or Hurting You? #7. Your Dosage - Are you taking enough? Is Synthroid Working for You? It may surprise you to know that just because there are millions of people taking this medication, doesn't mean that it is working for everyone. This makes sense when you think about it logically - why would one single medication work for millions of people? Aren't we all slightly different? After all, we look different, smell different, come in all shapes and sizes and so on. 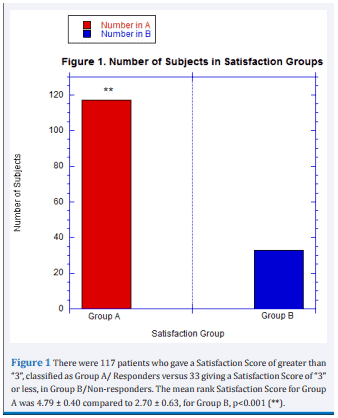 But surely there must be a scientific reason that patients on average tend to not be satisfied while taking Synthroid (1). It turns out that there are many reasons that may explain these issues that we see among patients and the goal of this post will be to explore many of those reasons. But first, we need to talk about Synthroid because it will make future information easier to digest. Synthroid is a brand name medication which contains the active ingredient thyroxine which is a bio-identical formulation of the thyroid hormone T4. You can think of Synthroid as a sort of hormone replacement therapy because that's exactly what it is. Just like you would take Testosterone (or estrogen) if those hormones were low in your body, you would also take Synthroid if your thyroid function was found to be low. Synthroid is, therefore, hormone replacement therapy for your thyroid and it is used in conditions which result in low circulating levels of thyroid hormone such as hypothyroidism and end-stage Hashimoto's thyroiditis. One potential problem with Synthroid is that while it is one of the most commonly prescribed thyroid medications many patients report being unhappy while using it. This unhappiness is usually the result of continued unresolved symptoms which are clearly related to low thyroid function in the body (2), but also other problems such as fatigue, weight gain and a reduction in quality of life. 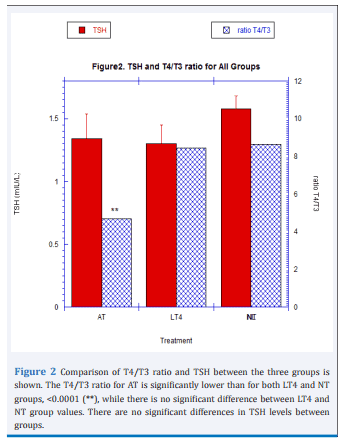 Patients who switched from T4 only medication (like Synthroid) to NDT (like Armour thyroid) show higher satisfaction (3) than patients taking T4 only medications and they also present with lower T4 to T3 ratios. On one hand, we have a large group of patients who feel terrible while taking Synthroid and on the other, we have some patients who do perfectly fine. We also have patients declaring that something is wrong while physicians largely ignore requests for changes in their medications. Believe it or not, all of these factors may be playing a vital role in your body and they may be the reason that you are doing well (or not) while taking Synthroid. Let's take a deep dive into each of these factors. These tips and tricks will help you have a deeper understanding of how thyroid medication works in your body and they are all backed by scientific research. Don't have a thyroid? They still apply. Suffer from Hashimoto's thyroiditis? They still apply. Been taking Synthroid for years? They still matter. Currently taking a combination of thyroid medication? This information is still valuable. We are all unique and we are all individuals. This means that we will all react differently to medications, the dose of medications we need will differ, the time that we take medication will differ and our genetics may alter each of these factors. Once we understand and respect this fact it's easier to have an honest and intellectual conversation about this topic. Probably the single most important concept when it comes to understanding thyroid physiology is the concept of peripheral thyroid conversion. This conversion process is so important because it is the process by which your body takes inactive thyroid hormone and turns it into the active thyroid hormone. Without this process, there is no active thyroid hormone and therefore none of the positive side effects associated with thyroid hormone action in the body. So what exactly is peripheral thyroid conversion? Thyroid conversion refers to the process by which T4 otherwise known as thyroxine (the active ingredient in Synthroid) is transformed into T3 otherwise known as triiodothyronine (the active thyroid hormone). This process is referred to as "peripheral" because it occurs in various tissues in the body and NOT in the thyroid gland itself. Synthroid is NOT the active thyroid hormone, it is the precursor to the active thyroid hormone and that is why it is so important. If you're following the logic here you can imagine a situation in which the thyroid precursor is not transformed into the active thyroid metabolite. And this is the exact kind of situation that many patients find themselves in when they take Synthroid (up to 15% of all patients to be exact). It may be entirely possible that you are taking Synthroid faithfully and it is being actively absorbed in your body BUT it is not being activated in your tissues. This process may lead to persistent symptoms of hypothyroidism despite having normal thyroid lab tests and a normal TSH. So what causes peripheral thyroid conversion issues? Genetics - Sometimes genetics work for you and other times they work against you. It turns out that some people have mutations in the enzyme responsible for the conversion of T4 to T3 which may make it work less efficiently. Individuals with this genetic mutation, known as a SNP, will not convert T4 to T3 as well as other individuals. Currently, the testing for this SNP is not standardized but you can make educated guesswork based on thyroid labs. Medications - It is well known that certain prescription medications may interfere with thyroid conversion. Medications such as anti-hypertensives, diabetic medications, and seizure medications are all included in this list. If at all possible it may be worth a look at your medication list to determine if you can consolidate medications or even change medications to see if it improves thyroid function. Inflammation - Systemic inflammation from any cause may reduce T4 to T3 conversion in the peripheral tissues. You can assess for systemic inflammation with serum markers such as ESR, CRP, and ferritin. Intestinal issues - A large portion of circulating T4 is actually converted into T3 in your intestinal tract known as the "gut". Therefore it makes sense that certain intestinal diseases may limit this process. If you suspect peripheral thyroid conversion issues you should evaluate for conditions such as acid reflux, intestinal dysbiosis, SIBO, IBD, and IBS. Endocrine disruptors (the environment) - Endocrine disruptors are chemicals that humans come into contact with on a daily basis which is found in plastics and other manufactured products. Small amounts of these chemicals don't seem to cause a problem for most people but certain individuals (probably due to genetics) may be particularly sensitive to them. Furthermore, studies from the endocrine society have shown that these chemicals alter serum thyroid lab markers and may make interpretation of these tests difficult. Another important consideration is the topic of absorption. Meaning: are you actually absorbing the medication that you are taking? It sounds silly, and many people just assume that they are absorbing their medication without a problem but that may not necessarily be true. Do you remember what the pharmacist tells you when you pick up your medication? They probably remind you to take your medication on an empty stomach or first thing in the morning (this is fairly standard). They want you to take your medication on an empty stomach because that gives your body the best possible chance of absorbing as much medication as possible. Taking Synthroid with food, medications, supplements, and juices/drinks/coffee may impair intestinal absorption of your medication. These medications include only those medications that limit thyroid ABSORPTION but remember that there are others which interfere with thyroid conversion as well. You may have noticed that this list includes very common medications such as those that contain iron (often used to treat anemia), calcium (often used to treat osteoporosis) and antacids (often used to treat acid reflux). If you are taking Synthroid, make sure that you are taking it away from medications which may limit its absorption! You can avoid these pitfalls by making sure that you take your thyroid medication in a "fasted state" which has been shown to ensure more stable TSH and serum thyroid markers (7). Certain supplements can impair the absorption of thyroid hormone. While other supplements may actually improve thyroid function. Sometimes it's better to take your medication in the evening as opposed to taking it in the morning. But didn't I just say that you needed to take your medication in the morning on an empty stomach to increase absorption? Yes and that is still true, but this new information is also true, just for different reasons. The idea behind taking your medication first thing in the morning is to help increase absorption because you will be in a fasted state - meaning you won't have food to compete with the absorption of food in your stomach. But there is one problem with this idea and it has to do with the speed of your intestinal tract in the morning vs in the evening. Your intestinal tract is actually more active in the morning, meaning it is faster, and therefore your medication (and food) will spend less time in the small intestines where it is absorbed. And this should make sense especially when you consider that most individuals have their bowel movements in the morning, this is because of the speed of the GI tract. So what's different about the evening? In the evening your GI tract slows down which means that Synthroid, and other medications, will spend more time in your intestines which may, therefore, increase absorption. And studies have actually shown this to largely be true as well. 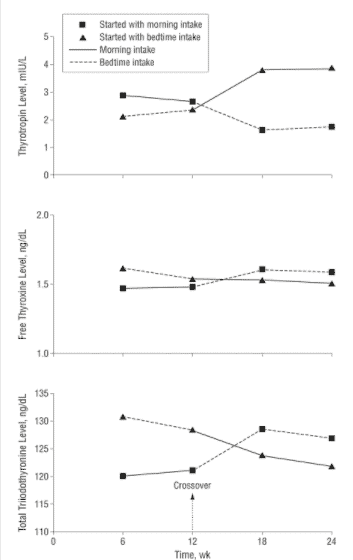 One study (which tested levothyroxine) showed (8) that taking thyroid medication in the evening significantly improved thyroid hormone levels of both free T3 and free T4 and showed a drop in TSH (labeled as Thyrotropin). And another study showed (9) that taking thyroid medication in the evening is at least as efficacious as taking it in the morning and may actually increase quality of life metrics in certain patients. There really isn't a downside to switching up the time of day that you take your thyroid medication but on the flip side, you might actually realize some serious benefits. The most commonly prescribed formulations of thyroid medication include the brand name Synthroid and the generic version Levothyroxine. For the purposes of the FDA, these medications are considered bioequivalent (10), meaning they should behave and act the same regardless of which type you are currently taking. Both medications contain the active ingredient Thyroxine but they differ in the types and amounts of inert or inactive ingredients. These inactive ingredients include various fillers, binders, and even color dyes to change the appearance of the medication. What's important here is that these inactive fillers, dyes, and binders may actually alter absorption and serum stability of T4 and TSH (11). Several studies have indeed shown that Synthroid and Levothyroxine are not bioequivalent (12), but this difference tends to only show in very sensitive patients such as patients who have very little thyroid reserve (those without a thyroid or with complete thyroid gland damage from Hashimoto's). This is very important because in the United States your pharmacist can substitute Synthroid for Levothyroxine which may cause issues for some patients. If you are taking Synthroid, (and it isn't working for you) you can request that your physician prescribe Levothyroxine and put on the prescription "dispense as written" which will force the pharmacy to fill the correct medication. This is usually only an issue for patients who are prescribed Synthroid because the pharmacy may try to save money on insurance by altering the prescription to the generic Levothyroxine version. Simply switching from Synthroid to Levothyroxine or Levothyroxine so Synthroid may actually provide more stable serum thyroid levels in your body and therefore reduce your symptoms. This is worth considering for certain individuals who may be sensitive to the differences in the inactive ingredients of these medications. Sometimes it's just nice to have options when it comes to medications. We've discussed that some people may do better when switching from Synthroid to Levothyroxine or vice versa, but there may actually be a better option and that's Tirosint. Tirosint is unique among T4 only thyroid medications in that it only has 4 ingredients. 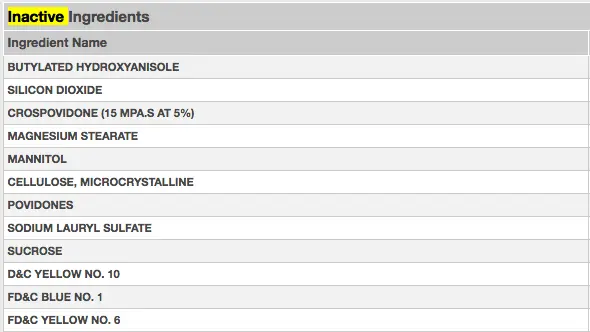 3 inactive ingredients (Gelatin, Glycerin, and Water) and 1 active ingredient (Thyroxine). It means that certain individuals with known conditions may benefit from the use of Tirosint over traditional medications such as Levothyroxine and Synthroid. Patients with known sensitivities to multiple medications, foods, etc. If you fall into the categories listed above then switching from Synthroid to Tirosint may be worth exploring with your current physician. You can also read more about Tirosint in this guide. This is a debated topic but it's worth mentioning here so that you are informed from the perspective of the patient. As you've probably noticed your dose of thyroid medication is usually determined by your serum value of TSH. TSH stands for thyroid stimulating hormone and it is secreted by your pituitary gland. The function of TSH is to act on thyroid glandular tissue and stimulate the release of T4 and T3 thyroid hormones. When you aren't taking thyroid medication you can use the TSH to diagnose hypothyroidism. If you aren't producing enough thyroid hormone from your thyroid gland (either from conditions like Hashimoto's thyroiditis, some nutrient deficiency, or because you don't have one) your TSH will start to increase or elevate. When your TSH reaches a certain point, usually around 5-10 mIU/L, you are diagnosed with hypothyroidism and your TSH is said to be too high. At this point, you are usually placed on thyroid medication such as Synthroid which will cause your TSH to drop or lower. Your dose is then adjusted until you reach some TSH that your physician feels is "optimal" for you and based on other factors such as your symptoms. This all sounds great in theory but the problem comes when we try to outline what is an "optimal" TSH level. Most physicians tend to believe that a TSH less than 5.0 mIU/L is probably sufficient, while newer studies indicate that a more healthy TSH is probably less than 2.0 to 2.5 mIU/L (13). Things get even more complicated when you consider that a healthy TSH may actually be closer to 1.0 when you remove confounding variables such as the presence of Hashimoto's in the data sample when these numbers were being determined. If you are taking Synthroid and your TSH is not close to 1.0 to 2.0 mIU/L, it may be that you are being underdosed or not taking a sufficient amount for your body. While the TSH may be helpful, it's certainly not the only thyroid lab test that you should be ordering or that can help you determine your dose (but more on that below). Sometimes you have to know when enough is enough. And what I mean by that is sometimes it doesn't make sense to stay on Synthroid or Levothyroxine if it simply isn't working for your body. Many patients find themselves in a situation where they are continually adjusting their Synthroid dose based on their TSH but they never actually feel better. It's like playing a never-ending game of whack-a-mole but without some prize at the end. Some patients will simply not do well on T4 only thyroid medications such as Synthroid. In these patients (roughly estimated to be around 15% of all patients with hypothyroidism (14)) thyroid conversion may be blunted in a situation which results in low free T3 and total T3 levels. It's not exactly clear why this occurs in this subset of people but it is likely related to genetic factors and the efficiency of a very important enzyme family known as deiodinases. What is known (at least subjectively) is that treating these patients with medications that contain T3 tends to result in dramatic symptomatic improvement. These patients often experience more weight loss (15), a better quality of life, less depression and higher serum T3 levels in the blood. Medications that contain the active thyroid hormone T3 include liothyronine, Cytomel, and formulations of Natural Desiccated Thyroid. These medications can easily (relatively) be added to your existing dose of thyroid medication and can be taken concurrently with Synthroid. And to put this into perspective that means roughly 1 out of every 6 to 7 people will need T3 in some form added to their regimen. If you consider that the US population is around 325 million people of which about 10% have hypothyroidism that means around 32.5 million people suffer from this disease. If you take 15% of that number (the number of patients who have thyroid conversion issues) it's around 4.875 million people who may need T3 medication. It should come as no surprise that you need more than just a TSH to evaluate thyroid function in your body. The TSH falls short as a universal marker of thyroid function in the body because it lacks the same deiodinases that exist in other peripheral tissues (16). This means that the sensitivity of the pituitary gland (and therefore serum TSH levels) is different from those of other tissues making it a poor marker of thyroid saturation in distant tissues. It also says relatively little about the peripheral conversion status of the individual or their genetics. It means that in order to have a more complete picture of what is happening in your body you will need more than just the "standard" TSH and free T4. It doesn't mean that the TSH is useless, not by a long shot. The TSH can be still used as a sensitive marker for the identification of hypothyroidism initially, but it shouldn't be used as the sole marker in thyroid hormone management. Total T3 - The total T3 is a marker of T3 in the body that is bound and represents a larger fraction than the free T3 portion. Free T3 - The smaller but more readily and biologically active form of T3 in the bloodstream. 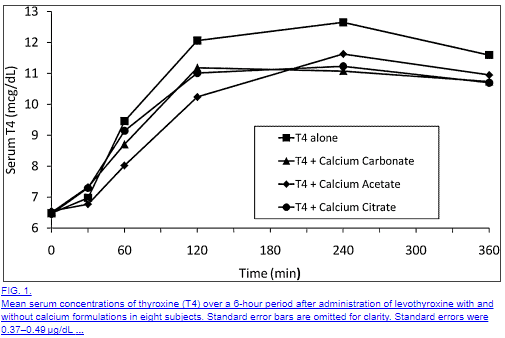 Free T4 - A reservoir for T3 conversion in the serum. Reverse T3 - An antithyroid metabolite which competes with T3 for cellular binding. High TSH while taking Synthroid - This is generally a sign that your dose is too low. Low TSH while taking Synthroid - This is generally a sign that your dose of Synthroid is too high. Normal TSH while taking Synthroid but with symptoms such as hair loss, cold intolerance, and constipation - This may be an early indication of poor peripheral thyroid conversion but more testing is required to determine this. Normal TSH with weight gain - You may be suffering from thyroid conversion issues or another hormone imbalance such as leptin resistance or insulin resistance. 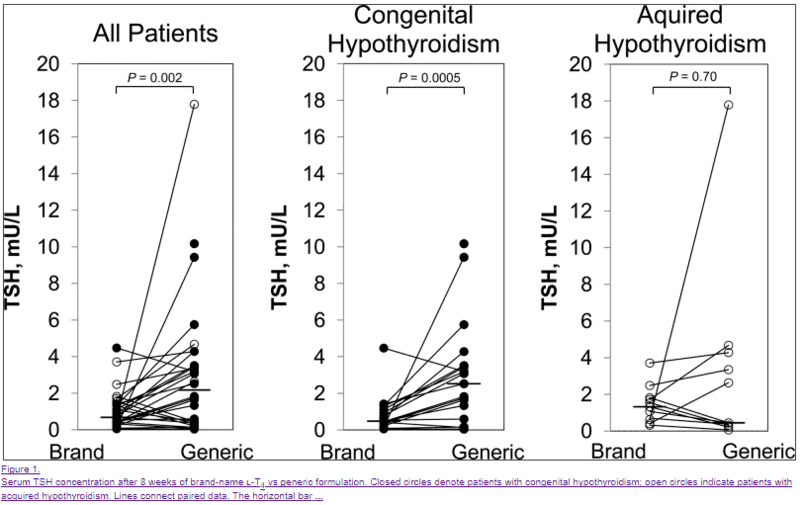 Normal TSH, normal free T4 with Low free T3 and low total T3 - This pattern may be indicative of poor thyroid conversion of low T3 syndrome. Normal lab studies but with elevated reverse T3 - Early thyroid dysfunction that is often seen in patients who have recently undergone calorie-restricted diets such as the HCG diet. Patients also under extreme stress will also show this profile (emotional, physical or psychological stress). If you are taking Synthroid, make sure you get a full lab panel to ensure you are properly analyzing your results. Failure to check something like Total T3 or free T3 may leave you confused and confound existing lab tests and symptoms. Whenever you take Synthroid (or any medication for that matter) it's always important to understand the side effects of that medication. Hormones are always difficult to dose because the reason you are taking a hormone is that you are deficient in some specific hormone. The problem is that the deficiency of the hormone causes side effects but the medication (or hormone) that you take to fix the problem also causes side effects. So you may be left in a situation wondering if your side effects are from the deficiency or from the hormone you are taking to treat the deficiency! This can get tricky, depending on the hormone, and this concept holds true for Synthroid. Synthroid has some very troubling side effects which may mimic the side effects of hypothyroidism. Synthroid is known to cause hair loss by itself and hypothyroidism is also known to cause hair loss. So what happens if you experience hair loss while taking Synthroid? You have to figure out if it's because of the Synthroid or your thyroid or both (You can learn more about how to treat hair loss in this guide)! Sometimes the answer is simply taking more Synthroid and other times the answer is to stop taking Synthroid - you have to tease it out. You need to always consider the beneficial side effects as well as the unwanted (negative) side effects associated with any medication or hormone that you take. So what are you supposed to do if you believe that Synthroid may not be working in your body? I first recommend that you take a hard look at the tips that we just discussed above. If you determine that Synthroid may not necessarily be the "right" medication for your body then you have some more work to do. It turns out that you can actually determine if your medication is working through some clever tricks (some you can do by yourself and others you need a doctor). ​If you've been suffering from worsening symptoms despite taking Synthroid or if your symptoms have suddenly ramped up again - you owe it to yourself to look into the problem further. Your thyroid is one of the most important mechanisms in control of your body temperature otherwise known as your "basal body temperature". Through some simple tests, it can be used as a "surrogate" marker for thyroid function. It's not 100% accurate but it can certainly be used (17) in conjunction with other steps to help guide you. When thyroid function is decreased, or when you aren't converting T4 to T3, your basal body temperature may be decreased. We know that under normal circumstances the body should be somewhere around 98.6 degrees Fahrenheit. A drop in circulating thyroid hormone can result in a drop in your whole body temperature by as much as 1 degree and set this new temperature as your "baseline". Knowing this information allows us to use your basal body temperature as a potential marker of thyroid status in the body. You can do this by simply checking your body temperature first thing in the morning each and every day and recording this information over time. Over a few weeks, you will end up with multiple readings (which can help wash out bad data) which can give you a general idea as to what your basal body temperature is on average. ...then you know something may be off. Your basal body temperature is also useful because it can be tracked you start taking thyroid medication. If you experience a low body temperature prior to taking thyroid medication then your body temperature should increase over a few months after you start taking thyroid medication. 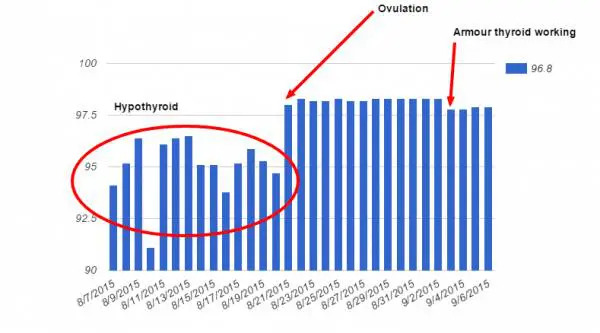 If you don't see an increase in your basal body temperature while taking thyroid medication then that may be a clue that you may have issues with thyroid conversion or may be experiencing some other issue. *Important note: certain medications such as beta blockers can limit this technique so don't rely on this method 100%. Quick Tip: To check your Basal body temperature get a thermometer and, before you get out of bed, take your temperature and record it. If your body temperature is < 97.8 there is a high chance you aren't converting T4 to T3 well or that you have adrenal problems. Another quick and dirty way to check if your thyroid is converting well is to just simply order the serum thyroid lab tests reverse T3. We discussed previously that in order for thyroid hormone to be activated your body must transform T4 into the active thyroid hormone T3. But your body can also turn T4 into the reverse T3 metabolite (18) which may block thyroid function. This is simply another conversion path that your body can use to regulate thyroid hormone at the cellular level. For our purposes, you can consider high reverse T3 to be something that may impair your ability to feel better as it results in competition for free T3. Reverse T3 is fairly easy to both order and interpret. Patients who present with high reverse T3 often have relatively normal thyroid lab tests which can be confusing to both Doctors and patients. High reverse T3 can complicate your thyroid lab tests and may be the reason Synthroid isn't working for you. Quick Tip: Get the following lab tests: Free T3, Free T3, Reverse T3. Calculate the Free T3/Reverse T3 ratio to evaluate if you have thyroid resistance. If your Free T3/Reverse T3 ratio is < 0.2 you have TOO much Reverse T3 in your body. Treatment: Consider switching to a medication that includes T3 (Natural desiccated thyroid or Liothyronine). In addition, you could consider taking supplements like Zinc or Selenium that can help increase T4 to T3 conversion. Another valuable tool in assessing if Synthroid is working for you is to look at the markers of T3 in the serum. Free T3 and total T3 can be checked in the serum (19) and allow you to gain insight into the conversion process, much like evaluating reverse T3. These values should increase with increasing doses of T4 medication like Synthroid which indicates that the conversion process is working. If you take Synthroid and your T3 remains low in the serum that may be a tip-off that there is some problem. But what is considered "low" T3? If your serum T3 levels (both free and total) fall in the bottom 10-15% of the reference range and you are symptomatic (weight gain, cold extremities, hair loss, etc.) then this may be an indicator of insufficient T3 levels. 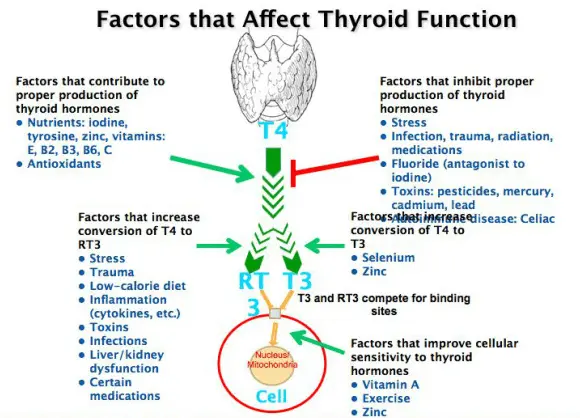 This kind of picture can be confusing, especially if you subscribe to the belief that the TSH is the only marker of thyroid function in the body. But if you look closely you can see a situation in which there are low circulating levels of both T3 and T4 in the body which may be contributing to this person's overall symptoms. These lab results paint a paradoxical picture in which there is obviously insufficient thyroid hormone in the serum which is being manifest by hypothyroid symptoms. The treatment, as in this case, is usually to alter the ratio of T4 to T3 that a person is taking (or add T3 to the regimen). 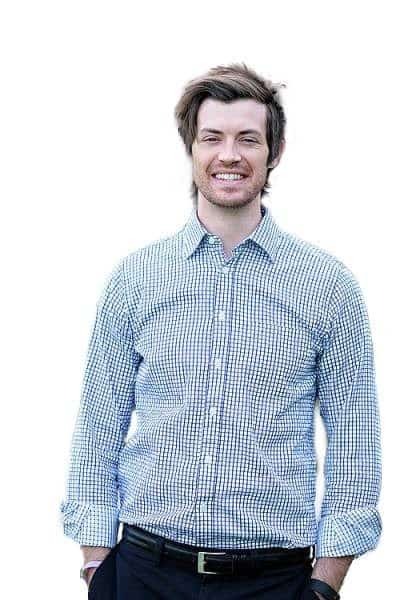 This pattern is often seen in patients who have Hashimoto's (due to glandular damage) and those who have undergone several calorie-restricted diets. Bottom line: on Synthroid, your Free T4 levels may be "normal" but always look at Free T3 levels as well! Free T3 is the active hormone and it is the most important hormone. Quick Tip: If your lab tests are in the "normal range" but still on the low end of normal you still may benefit from taking thyroid medication! I would recommend a trial of thyroid medication to see if your symptoms resolve. One last very important tip is to always consider your symptoms (in addition to lab tests). There is a common adage expressed in medicine which says to treat the patient, not the labs - and this concept holds true for thyroid function. You have to remember that serum lab tests are not always accurate and you have to consider that there will always be some patients who simply don't fit the mold. Our understanding of thyroid physiology is still expanding so it's foolish to assume that we have all the answers. It's also important that you don't focus solely on your lab tests if you are not symptomatic. In some cases, it can cause more harm than good by adjusting medication if you are already doing well. While your symptoms should not be used in lieu of lab tests, they should absolutely be taken into account when interpreting lab tests and determining if doses should be adjusted. Synthroid is one of many thyroid hormone replacement medications that exist. While it may work for many people, there are many people who may require different medications and different combinations of T4/T3. If you are taking Synthroid, make sure that you at least consider the 10 tips discussed in this article as they may be able to help you feel better. Simply switching the type of T4 medication you are on or altering the time of day that you take your medication may be able to improve your thyroid status. Is it currently working for you? Do you think you may need to switch or alter up your thyroid medication to feel better?